It was cold last night, and the mattress that Intrepid supplies was thin, plus there was jetlag – but at least it turned out that the greatest danger in having to go for a nocturnal pee was encountering another camper lurking behind the tents, rather than something with more legs. Turns out 2am is a common wake-up time for many bladders. We were up at 6am (wet-wipe wash in the tent – there was no water running in the toilet block), busily stowing tents away before breakfast by the still-burning campfire. As we ate,we were watched at a distance by a troop of baboons who descended on the site as soon as we left it, checking for crusts. Our game drive back out of the park, completing the circuit around the lake, was less productive than yesterday, but we did get close to some very elegant giraffes and zebra; and it was a revelation to some of us just how glamorous an African starling can be. Think iridescent blue. We lunched again at yesterday’s stop, a great fascination to the local children who took huge delight in mirroring the Intrepid ritual of post-meal plate-flapping (to dry them after washing). Then we hit the road again and it was the story as before: vivid, vibrant glimpses into people’s lives – and that of their animals. Donkeys, chickens, goats, sheep, cattle, hens; shops and stalls; forests, fires – and phones. Though the people are poor, that giveaway bent neck is visible everywhere. 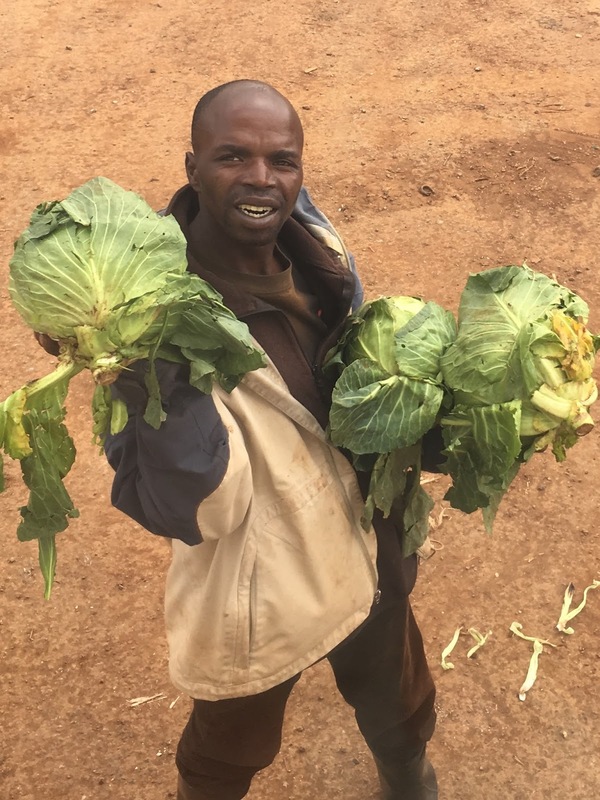 And truly, they are so poor, and have to work so hard to scratch a living, leaping forward to the truck when it slowed for traffic or a speed bump, smiling widely and holding up all sorts of goods to sell, some of them the essence of optimism, like cabbages. So many people have nothing to do all day but sit and wait for time to pass. It seems a terrible waste of potential talent, and of life itself – but maybe that’s just a Western view. It’s a superficial observation, but they mostly did seem nevertheless engaged, and cheerful. Finally we arrived at Eldoret, to a lovely campsite run by an even lovelier lady. There were hot showers (this style of travel means you can’t take the hot bit for granted) and rooms to upgrade to for those who wanted to pay extra – which meant that the frugal types (me, natch) were joyfully able to double-mattress for the night. Tonight, chef OT had to correct my julienne technique for the carrots, which was chastening. Dinner was pumpkin soup and beef stew. I shared mine with a most unusual animal to see in Africa – a cat. Honestly, they are rarer than rhino in my personal experience. As the group gels there is beginning to be a shade less *cough* travel skiting and more actual conversation; and the dynamics are sorting themselves out. The roles, for example, of the Loud one, Most irritating person and the Know-it-all have already been taken – coincidentally, all by the same person. Tonight there was singing to a guitar accompaniment. I didn’t take it too hard that one of the songs was a personally apposite Beatles number (that’s all I’m saying).